JRPG’s are making a great comeback on the Nintendo Switch and there is plenty diversity in the genre. One title that played it safe, but was still fun and enjoyable was developer Exe Create’s title Asdivine Hearts, of which I had the privilege of playing last year. While it was a solid experience, I couldn’t help but notice too many of the mobile game tendencies making their way over to the Switch version. Now, in 2019 we have a new release in the series with Asdivine Hearts II, and while it’s a solid title in its own right, I can’t help but feel this is all too similar. 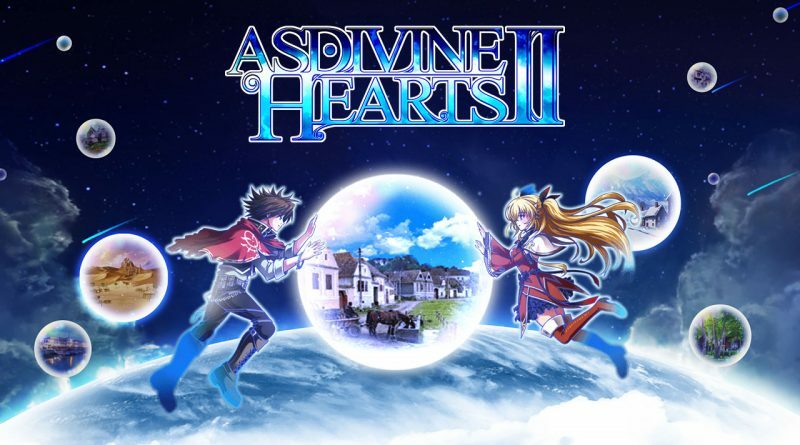 Asdivine Hearts II is a sequel to the original title that released last year on the Switch. This sequel picks up two years after the events of the first game where the same crew finds themselves thrown into another quest, but this time to save the parallel world of Archelio which is on the verge of being frozen on ice. Zack and the rest of his group must then make their way through impending danger to save the land. If this sounds generic it’s because it is, brimming with plenty of tropes and not particularly standing out from other great JRPG’s. One big problem I had with the plot is that within the first hour in order to continue the narrative from the first title, characters started at max level. This is eventually removed once you get to the first major area, but it almost makes it so you have had to play the first game to understand anything of what’s going on. While a appreciate an overarching narrative loop, this makes things too overwhelming to thoroughly enjoy for the first hour or so. All in all, it was a decent story, but nothing more or nothing less. On the subject of tropes, I think Asdivine Hearts II has an identity crisis, as literally every other character is female. This is fine by itself, but when it seems like every woman is obsessed with and in love with the main protagonist Zack, it comes across as somewhat strange, as Zack can form bonds with certain characters to gain “trust” by interacting and making the right dialogue choices. This is important, as every main character can influence the end of your game by how much trust they have in you. I just wish they would have tried a more subtle approach to this system. Since Asdivine Hearts II was originally a mobile title like the original there are some gameplay quirks that don’t really feel right, but are serviceable for a simple JRPG like this. With the battle system, you can have a support character that can do actions for you, such as using spells to defend fellow teammates, decrease the cost of spells for the main character, increase damage dealt to the enemy and more. If you decide to utilize both your main and support in the same turn, you have the potential to do an incredibly powerful combined attack that is known as a union attack. When using a union attack, care must be put into consideration though. In order to properly use one, you first must select a spell with your main character, as this will be the base for your attack. Next, you will want to see what support spells have a question mark next to them and select that. Should you do everything properly, you will see a tremendous magical spell (which is delivered in some amazing retro goodness which I’ll touch on later) that deals an incredible amount of damage. Your attacks (of any type) build what is called the trust gauge, and it’s from this front that you will utilize these immensely powerful attacks. A returning gameplay element from Asdivine Hearts is the Rubix system and it’s still one of my favorite aspects. As explained in my original review, the Rubix system is what allows you to develop your character’s bonuses by socketing jewels. You start with a basic grid layout, and through your battles and collected chests, you will be able to pocket various shaped jewels that will grant bonuses to your character’s stats. Also, you can combine jewels to make more potent ones, or if you’re lucky, utilize them as one of your new companions. All the jewels are not made equally though, as some do contain monsters within them that, should you use them, will actually fight alongside you, or can be called upon to access their own skills for a fight. How you decide to use these types of jewels will impact your battles greatly, so make sure you get accustomed to trying different arrangements with different characters to see what works best for you. Should you also feel the need to battle these monsters, you can use them within an arena in the game where the more difficult the battles, the bigger the prizes are. Visually, you can tell this is a port of a mobile title, since when playing docked anything above 720p resolution looks blurry and not optimized for the hardware. The sprite work is decent and the particle effects provide a radiant sheen to the art style, but the animations are stiff and maintain the 16-bit era characters walking in place as their idle animation. While this delivers some authenticity to JRPG’s of the past, it would have been nice to see some improved animations to go along with the gameplay. Terrain and other landmarks don’t really stand out either, with some of the tiles not lining up or overusing certain graphical assets. Fortunately, the sound design is probably the best part of Asdivine Hearts II as the music has the signature epic tone found in many JRPG’s and does it well. However, there’s not much variety to each track and you’ll often hear sounds reused for different attacks and actions in the game world and the music that initially starts off as charming quickly becomes repetitive as you realize they’ve chosen to have these songs on an endless loop for each area of the world. Overall, Asdivine Hearts II stays true to what worked for the original, but at the same time feels like a missed opportunity. The combat system and music stood out, but the visuals and story were lackluster in execution, leading to a fluctuating experience that never felt right on the Switch. Asdivine Hearts II is just an okay JRPG, and in this day and age okay is just not enough, but I guess you could do worse as it won’t leave a bad taste in your mouth at least.